You don’t need to have a green or social business to be able to protect the environment. A few years ago I researched and wrote the content for an app called Biodiversity is Us. 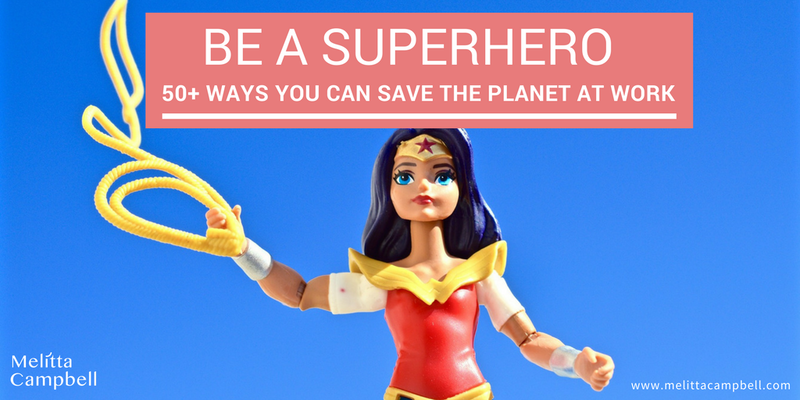 Its aim to was to show people the many simple ways they can help protect our planet every day – it’s a lot easier than you might think! As with all things, it’s the small actions we take on a regular basis that add up to the biggest difference. Here are the tips from the app that you can apply at work. Start making those little differences and you'll start to make a great difference to the future of the environment, as well as to yourself and your business! Promote biodiversity at work by suggesting team-building events that involve discovering or promoting the local flora and fauna. Volunteer at conservation projects, create a nature, flower or vegetable garden, take a nature walk…the possibilities are endless. Spend your breaks outside observing nature. How does the local environment change each day? Do any plants or animals need help to thrive? Don’t sit at your desk all day. Get more productive by taking a short walk outside to re-energise your body and mind. 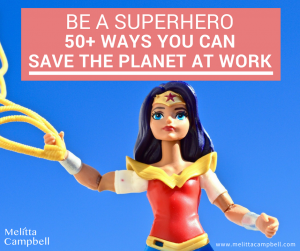 Encourage your team to do the same - the more time we spend outside, the more we want to care for the planet. Save paper by recycling envelopes and packaging. This will save trees and other natural resources. Reduce waste by buying durable or reusable products instead of disposable ones. Less waste means less pollution. Recycle card and paper. This saves water, energy and trees. Care for, maintain and repair durable items. Making them last longer means less waste and less pollution. Introduce diversity into your garden, balcony or communal areas and return plastic plant containers back to the store. Print less and use both sides of paper to save resources and protect the environment. Go electronic for bills and payments. This reduces energy, resources and pollution. Use less paper. Use envelopes, and scraps as notepaper before recycling. Pass on books, newspapers and magazines instead of throwing them away. Perhaps the local school could benefit from your books. Or why not set up a book-sharing club with other companies in your area? Turn waste into cash by selling on items that are no longer needed. There are lots of second hand sales and websites to help. Use durable coffee cups in the office, these can be washed and used again unlike disposable cups. Buy paper products made from recycled paper. If everyone did this it would save hundreds of thousands of trees and reduce pollution. Recycle and reuse glass and aluminium. They are made from elements in rainforest soil, so recycling helps limit damage to tropical forests. Use an online footprint calculator, like the one at Earthday.org. Why not discover your score with colleagues and other businesses and find ways to reduce your impact together. Join the local library instead of buying new books. This saves resources and gives you access to thousands of titles at a very low cost. Look for eco-friendly alternatives to your regular products. There are eco-friendly versions of most products from paper, to plant pots, furniture to building materials. Limit the amount of plastic bought and used in your office. There are large islands of plastic rubbish forming in out oceans, harming marine life. Give unwanted goods to others who could use them instead of throwing them away. Visit The Freecycle Network and find out how. Install a green roof. It can improve insulation and air quality, retain rainwater and give a home to lots of insects and birds. Contact a specialist company. Compensate for your environmental impact by supporting nature protection associations and financing conservation programmes. Donate funds to a reforestation project. Every day hundreds of hectares of forest disappear from our planet. Help fight back by supporting one of the many organizations working to protect our forests. Download the sounds of rare and threatened animals for your company phones. The ringtones providethe chance to talk about that animal and how you support biodiversity. Turn the thermostat down by 1o. This not only saves energy, but can cut the heating bill by 10%. Charge mobile phones by day. Leaving phones to charge over night wastes a lot of energy. Buy Energy Star rated appliances to save water and energy (and money!). Not forgetting to recycle old appliances of course! Switch to energy saving light bulbs – they use up to 75% less energy and last up to 10 times longer than traditional bulbs saving you energy and money in the long-run. Use solar power to run household appliances. It is eco-friendly, endlessly renewable and practically noise free. Ask your local authority about grants and subsidies. Save power and save the planet. Maintain air conditioning and heating systems so they use less energy. Plug electronics into a powerstrip and turn this off when not in use. Even on standby electronics use a lot of energy! Unplug phone chargers when not in use. Chargers left plugged in waste a lot of electricity. Turn off the lights in empty rooms and corridors. This will save money and precious resources. Recycle old batteries. They contain heavy metals that pollute the environment if thrown away. Donate old electronic products for reuse to extend their life, reduce pollution and save energy and natural resources. Recycle mobile phones and batteries. They use an element called ‘coltran’ found in rainforest soil. Vital tropical habitats are being lost due to coltran mining. Reduce, Reuse and Recycle to help lower arctic pollution and global warming. Upgrade your computer instead of buying a new one. Cut C02 emissions by walking, cycling or using public transport instead of the car or motorbike. Don’t leave heavy items in the car unnecessarily – extra weight uses a lot of extra fuel which means more cost to you and more pollution in the environment. Take the stairs instead of the lift. It not only saves energy, it is great for your health! Offset your travel whenever possible – most airlines provide an option to offset the carbon emissions related to your travel when you book your tickets. Use food from local producers and serve seasonal fruit and vegetables. This will benefit both health and biodiversity. Buy a lunchbox. Reusing a lunchbox instead of paper or plastic bags will save a lot of waste. Take a packed lunch to work in a box. Homemade lunches are healthier and use much less packaging and energy than buying take-away food. Eat organic and locally grown foods. It helps reduce the clearing of forests for agricultural land and supports small local producers. Grow vegetables in your office garden or balcony that you and your team can enjoy fresh each day, such as tomatoes. Have an office ‘Veggie’ day once a week. Not only is it good for your health, but meat products use much more water, energy and resources to produce than plant-based food. Never play golf in dry areas. They have a negative impact on the local environment and they dry out aquifers to water the greens. Play golf on environmentally friendly greens that are protect natural areas and wildlife habitats. And buy pre-used golf balls, rather than new ones. Offer client gifts that make a difference. Why not offer them a Kiva certificate that helps change lives by providing new entrepreneurs with micro-finance, or an Oxfam Unwrapped gift that provides tools and resources to people in areas where they need them most. When choosing merchandise to promote your business, choose durable items that won’t pollute the environment a few weeks later. Better still, choose something that encourages others to care for the environment too. Publically share the many big and small ways your office is making a difference to the environment to encourage more businesses to do the same. Share what you have learned in this article with your colleagues, friends and family. The more people that care about the world and its animals, the more people will help to protect biodiversity. Download the free app Biodiversity is Us or watch one of the ‘Biodiversity is Us’ films on YouTube and encourage others to do the same. Produced by WAZA, it also has lots of information about animals too, so you can enjoy the app with your entire family. How Are You Protecting Biodiversity? Are you already doing any of these? What other ideas do you have for protecting biodiversity? Share your activities and ideas in the Comments section below. This is a very thoughtful and detailed post. How do you suggest we prioritize it now that we know what to do? 3) actions that you might be able to consider 2-3 years from now. Then add these to your current business or actions plans and get started. We have started to recycle the paper at work. We are not really big on recycling here in Barbados unfortunately. Thanks for sharing the innovative ideas we all need to do more to preserve our planet. It’s a start and every small action counts, thanks Tachira. The environment really needs to be protected through going green. In my areas, wasted plastic and rubbers are being gathered by govt officials everyday to take them to recycling plants. That’s great that your local authority is doing so much to help. If we all play our bit too, we can make a big difference! Thanks Rawlings.